We opted for the 3-day pass because it was a better deal than getting a couple of two day passes. For only $50 for a 3 day adult pass, I was interested in checking it out and seeing the panels that we would normally miss at San Diego Comic Con. Plus Nicholas Brendon who played Xander on Buffy the Vampire Slayer was going to be there and apparently I < 3 him. (I had a fan girl freak out moment when I first saw him do the Snoopy dance a couple years ago at SDCC...) The big bonus is that kids under 10 are free so our kids are able to come check out what Comic Con is all about with no extra expenses. I took the kids with me on Thursday. We arrived at about 12:30 pm and found parking easily in the underground parking at the Salt Palace. Parking was a flat rate of $12. The line to register was super quick. It was basically a walking queue that took a minute to walk through. I had the quick pass QR code downloaded on my phone which made it super quick too. They just pointed me to one of the people with iPad minis to scan my code then they gave me my wristbands and my swag bags. The downside here was that the wristbands I got had to last 3 days which isn't a big deal to me, but having a badge would be so much easier. 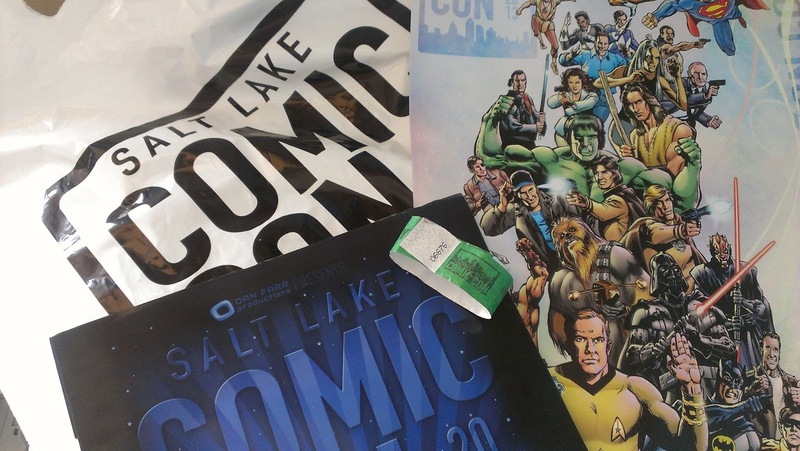 The swag bags are also a let down, because it's just a plastic bag with the logo, a SLCC poster, and a guidebook. The poster is actually pretty cool so all was not lost. Nicholas Brendon's panel was scheduled for 2 pm and it was on the Main Stage which I assume is the largest room. I got in line an hour earlier because there was nothing to do yet. The con didn't offically begin until 4 pm which was when the exhibit hall opened. Not sure why they had panels before then, but oh well. They loaded the room with those with VIP tickets first then we were let in about 5 minutes before it started. I was shocked by how large the room was when I first walked in and everyone in line easily fit into the room. This was my third time seeing Nicholas Brendon and I was definitely more accustomed to his personality. He was fun and it was a Q&A format with the audience the entire time with a good chunk of people fishing for personal favors which was getting kind of annoying. He was a good sport though and at least 2 people in the room named their sons after his Xander character. The above video is of his Snoopy dance. Turn the volume down beforehand though. The other panel I went to was Brian Krause's panel. He played Leo in Charmed which I was a big fan of when it was on and I really liked Leo. I had no idea it it was on for 8 years. Buffy went on for 7 years. No wonder I love TV so much. It seems like all I ever did was watch TV now that I look back on how much time I've spent on so many different shows. This panel was in room 700 which was a smaller room than the main stage. I got in line 10 minutes early and it wasn't a large line at all. When we were all let in, it comfortably fit everyone in line. I don't really know a whole lot about Brian Krause, but it was interesting to hear from him and his experience on Charmed. Sadly, it is a bit crushing to hear that the cast didn't really hang out much off set although I should have remembered this from when Shannen Doherty left the cast. All in all, it was good to see him too and he seemed to really enjoy his time there. I attempted to get into the exhibit hall after the panels were over, but aside from the VIP entrance where VIPs could walk right in, there was only one other entrance and the line for that stretched out around the building. After finding the end of the line, I decided that it wasn't worth it since I had to leave early anyway. 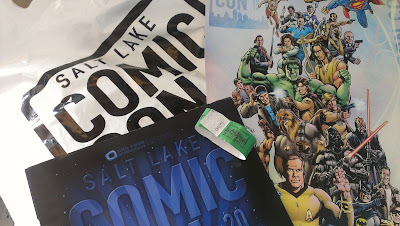 The first day was a decent success with minimal waiting for the panels and the kids sat through all the panels quietly. The crowds weren't too bad yet and it was a nice introduction into what to expect for the rest of the convention.